OCWorkBench received a photo of the upcoming ECS A890GXM-A, a new motherboard with the AMD 890GX + SB850 chipsets. This board features Dual GigaLAN, 15u Gold Contact, eJIFFY, Cooltech III, 4most Display (HDMI,DVI-D, D-SUB and DisplayPort), eSATA. 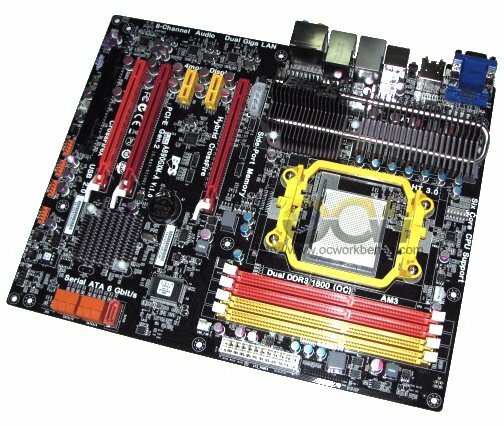 The board also comes with 3 full length PCIe 2.0 slots supporting CrossFire X. The integrated graphics on the chipset also supports sideport memory and Hybrid CrossFire with a compatible graphics card. It also natively supports SATA 6Gbps standard. Most importantly, the chipset on board officially supports the future 6 core processor Thuban.